The Minister for Education has announced funding of $800,000 for a Family-School and Community Partnership Bureau that will help develop partnerships between parents, schools and the community. The Rudd Government will provide the funding over four years to two key national parent bodies - the Australian Council of State Schools Organisation (ACSSO) and the Australian Parents Council (APC) - to conduct research and develop pilot programs to ensure schools are more welcoming to parents and the broader community. The government recognises that while formal education settings are an important part of a child’s education, parents play a key role in bridging the education experience a child receives at school and at home. The new Bureau will work with organisations across the country in developing and encouraging effective partnerships between schools, parents and the broader community to improve students’ learning experiences and outcomes. In announcing the initiative the Deputy Prime Minister Julia Gillard indicated that "the aim will be to reach the disengaged, the disempowered and those families that often are not drawn into their children’s learning." As a young Dad (25+ years ago) one of the most wonderful times each week was Saturday morning when I'd take my daughters to the local library to choose some books. We'd come back with 15-20 wonderful picture books that were read and re-read all week until our next visit. Today my grandchildren experience the same joy with their parents who are following the same pattern that they experienced as children. The local library is a wonderful resource. An academic colleague of mine, Dr Allen Berger from Miami University of Ohio (USA), has recently written an interesting opinion piece in a US newspaper on the value of libraries and books. 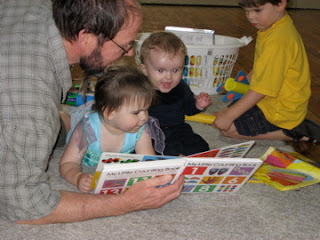 For many years Allen has taught and written about literacy. One of his current involvements is serving on the Board of Trustees of Live Oak Public Libraries in Savannah Georgia. In this article he makes a simple (but important) point. In an age where we are concerned about being wise with the world's resources, books and libraries reduce waste and increase shared use of resources with other wonderful benefits for children and adults. Here is an extract from the complete article. Among our most precious resources are our books. It’s fascinating to observe how books already are recycled in libraries. Many books are read, returned, borrowed (and recycled) more than a hundred times. “Right now 135 people are on a waiting list for James Patterson’s new novel, 7th Heaven,” said Diane Bronson, collection development coordinator for Live Oak Public Libraries. “Twenty-seven copies have been ordered,” she added. Some award-winning children’s books are read so many times that they literally fall apart and have to be replaced. These include Maurice Sendak’s Where the Wild Things Are, Gertrude Chandler Warner’s The Boxcar Children Mystery series, and Dav Pilkey’s Captain Underpants series, according to Judy Strong, youth services coordinator. The public can buy used paperbacks for fifty cents and hardcover books for a dollar in many libraries regularly. Videos are available for a dollar and audios sell for a dollar on up. People can also bid for used (or pre-owned, to use popular advertising jargon) books, videos, and audios at silent and live auctions. DVD’s are now so popular that three-fourths of the thousands owned by libraries are in continual circulation. Years ago people were worried that movies would supplant books. But librarians know that when there’s a popular movie they had better have many copies of the book on which the movie is based. People see a movie, like Seabiscuit or Midnight in the Garden of Good and Evil, and then go to a nearby library to borrow the books. Sometimes it’s the other way around: people see a movie and want to read or hear the book. To enable the public to reach the Internet there are 300 computers available in the nineteen libraries of the Live Oak Public Libraries in Chatham, Effingham, and Liberty counties. Computer use is soaring with a total of 645,798 computer sessions during the most recent fiscal year (July 2006 to June 2007). That’s a jump of nearly 61,000 computer sessions over the preceding fiscal year. In most libraries you’ll also find a variety of newspapers and magazines enjoyed by people daily. I hope you get Allen's point. The library and the books within them are a precious community resource which we need to protect. Today, the library is an even richer resource than it once was with DVDs, toys, access to computers, databases and so on. I could go on to talk about equity issues; for example, the service that libraries provide to families that can't buy books, the importance of 'talking' books for the blind and so on. Maybe that's another post! Let's use and defend libraries. I mentioned in my first post on the importance of play that while children's play is critical to optimal child development, increasingly children are being raised in such a hurried and pressured world that their development is being impeded. Major child rearing agencies, early childhood associations, paediatric groups, and government agencies with responsibility for children and families, have been raising serious questions about declining spare time, and in particular unstructured playtime for young children. Play enables children to use their creativity while developing cognitively, emotionally and socially. 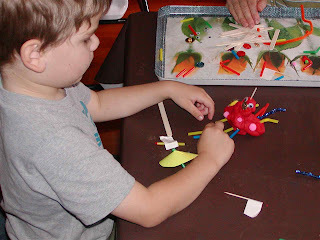 It also encourages imagination, fine and gross motor skills, decision-making, problem solving and so on. 1. Children benefit from play with adults, and there are advantages in the experience of play situations with varied adults. "As teachers or parents, we are never neutral; by what we choose to acknowledge and participate in, we are communicating to children what we think is important. Fortunately, adults have diverse interests, and children learn different things from the different people in their lives." 2. Adults need to be careful not to exercise to much control over play, otherwise it ceases to be play. "It is important, however, that children learn that they are competent people with good ideas. They can be denied this right by adults whose need to play a starring role leads them to ignore the fact that play is the children's turf, which needs to be entered with care. Adults itching to play teacher are likely to interrupt children's play for the sake of their own wonderful ideas. Play is children's world, and adults who take it over are denying children's need to invent it for themselves. Yet children benefit from adults' ideas, and adults benefit from being free to do things they like to do." 3. Adults can enjoy play too and learn how to engage with children and learn about children as they too enter into shared play situations. "Adults can learn to share their own playfulness with children without overwhelming them or performing for them, if they stay aware of children's developmental levels, children's interests, and what's playful for children." 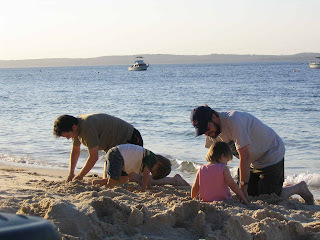 I have built on this post recently and my first post on play with a third post that explores how adults can engage in play situations with their children, The Importance of Play - Part 3. Children's play is seen by psychologists, educators and paediatricians as so important to optimal child development that it has been recognized by the United Nations High Commission for Human Rights as a right of every child. But in a clinical report to the American Academy of Paediatrics, Kenneth R. Ginsburg concluded that "Many of these children are being raised in an increasingly hurried and pressured style that may limit the protective benefits they would gain from child-driven play." Major child rearing agencies, early childhood associations, paediatric groups, government agencies with responsibility for children and families have been raising serious questions about declining spare time, and in particular unstructured playtime for young children. For example, in a recent edition of the Belfast Telegraph a report from 300 teachers, psychologists and children's authors claimed that the erosion of "unstructured, loosely supervised" playtime is dangerously affecting young people's health. In their play, children invent the world for themselves and create a place for themselves in it. They are re-creating their pasts and imagining their futures, while grounding themselves in the reality and fantasy of their lives here-and-now. Play allows children to use their creativity while developing their imagination, dexterity, and physical, cognitive, and emotional strength. Play is important to healthy brain development. Play allows children to create and explore a world where they can achieve a sense of mastery. Through play children can also conquer their fears while practicing adult roles, sometimes in conjunction with other children or adult caregivers. As they master their world, play helps children develop new competencies that lead to enhanced confidence. Undirected play allows children to learn how to work and create with others, to share, to negotiate, and to resolve conflicts. Play is essential for the building of active healthy bodies. So play is critical to children's development, and time is essential to create 'space' for play. There are challenges here for parents and teachers. How do we resist the temptation to structure children's life in and out of school so much that there is little opportunity for play? 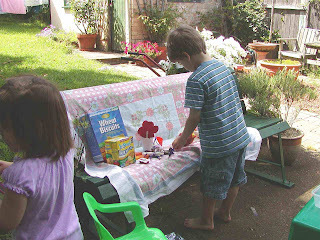 As well, how do we encourage children to spend time with other children engaging in play? In a future post I'd like to say more about the role of adults in children's play. Helping children to become better writers. Helping children to become better readers. Tips for parents to help their teenagers write better (you need to download this one as a PDF document). Another brilliant resource is the Read.Write.Think section of the NCTE site. While those of us in the southern hemisphere (the top of the world!) will find that some of the ideas have a north American flavour, there are some great suggestions for holiday, weekend or after school activities. It's a shame I didn't post this before the Australian Summer vacation ended. This very helpfully provides ideas by grade and age group. Given the variations in the use of grade names and the different starting ages for children (see my last post), I'd suggest you choose the right section by age, not grades.